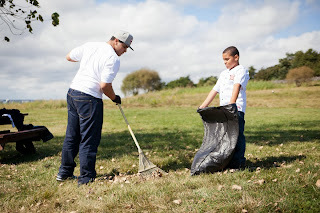 On the Saturday morning after the Red Sox clinched the American League Division East championship, Save the Harbor/Save the Bay's staff and interns spent the day with 88 Red Sox fans clearing trails and beaches on Spectacle Island in the Boston Harbor Islands National Park. Our crew of 88 volunteers included a team of college students and alumni from the Coca-Cola Scholars Foundation, a team of Boston Red Sox Scholars, as well as employees from the Coca-Cola plant in Needham and kids and families from the Red Sox "Reviving Baseball in Inner Cities" (RBI) program. "What a great way to celebrate the Red Sox win and give back to our community," said Carnegie Mellon graduate and Coca-Cola Scholar Ranjit "RJ" Korah, Regional Alumni Coordinator for the Coca-Cola Scholars. The day began with a quick boat ride to Spectacle Island on one of Bay State Cruise Company's fast catamarans. Mike Nigro, Distribution Center Manager for Coca- Cola at their Needham plant, put it like this: "At Coca-Cola, we know that when people come together, good things happen. One of the ways that Coca-Cola gives back to Boston is through our support of Save the Harbor, Save the Bay's sustainability initiatives. We all have a role to play in keeping Spectacle Island and Boston Harbor clean and free of debris. 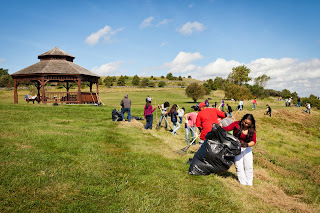 Our Coca-Cola associates and scholars helped us deliver on our commitment by participating in the clean-up." 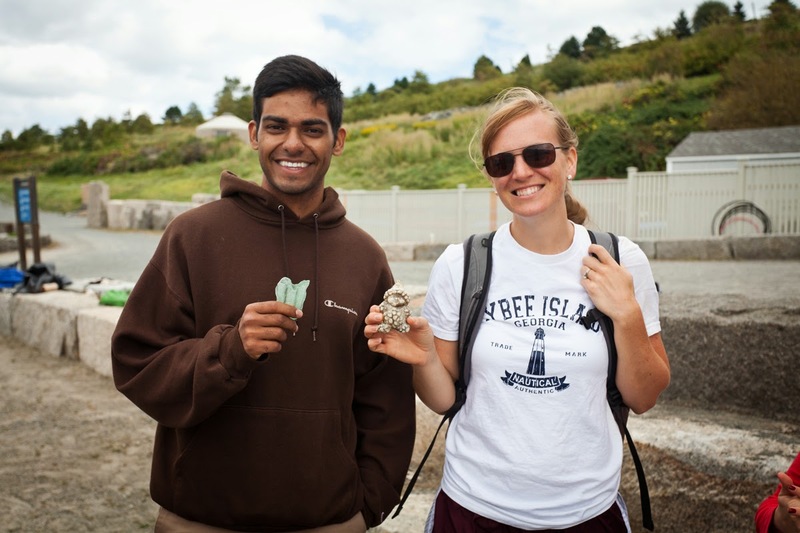 On the island we divided into two teams: One group tackled the trails, removing weeds and invasive species while the other group hit the beach and removed more than 30 bags of trash and lots of debris. "The Red Sox Foundation and our Red Sox Scholars and RBI kids and families are committed to giving back to our community." said Red Sox Foundation Interim Director Gena Borson. "Thanks to Save the Harbor / Save the Bay for giving our team the chance to make a difference on Spectacle Island." pitched in and helped make the day a success. After the clean-up volunteers enjoyed a picnic lunch at the visitor's center and then explored the island with Save the Harbor's staff and interns. Even though the tide was high, participants searched the beach for artifacts and beach glass from the last century, when Spectacle was the city dump and not a destination for the region's residents and visitors alike. 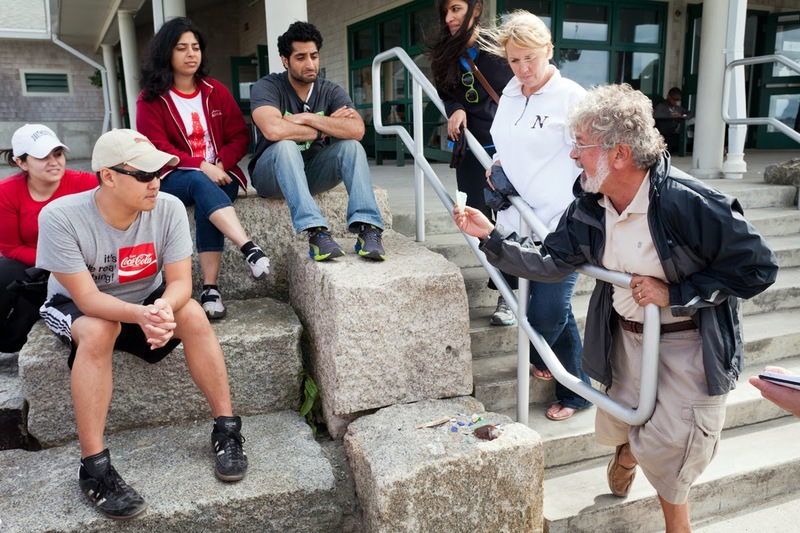 Save the Harbor's Bruce Berman (right), shares the Treasures of Spectacle Island at the visitor center. 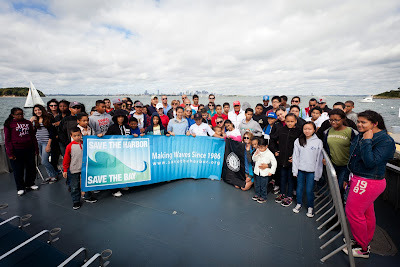 “It was great to spend time on Boston Harbor with our partners from Coca-Cola and friends from the Boston Red Sox Foundation," said Bruce Berman of Save the Harbor / Save the Bay. "Seeing Boston in the distance gives us all a great sense of perspective about our community. We really appreciate all their hard work and support." If you would like to join Save the Harbor/Save the Bay on a free Treasures of Spectacle Island Cruise on October 26, 2013, please send an email to info@savetheharbor.org. Save the Harbor/Save the Bay (SH/SB) is a non- profit public interest Boston Harbor environmental advocacy organization whose mission is to restore and protect Boston Harbor, Massachusetts Bay, the Boston Harbor Islands, the Boston Harbor regions public beaches, Boston’s waterfront and the marine environment for everyone to enjoy. 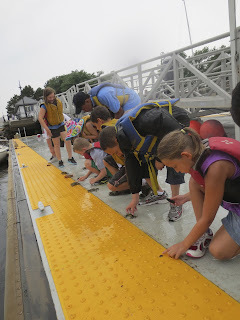 For more information about Save the Harbor, please visit www.savetheharbor.org. 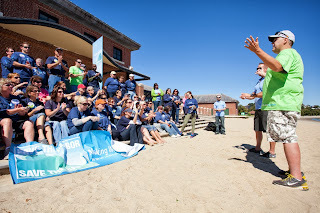 On September 18, 2013, eighty employees from Blue Cross Blue Shield of Massachusetts joined Save the Harbor/Save the Bay for a beach cleanup in South Boston. 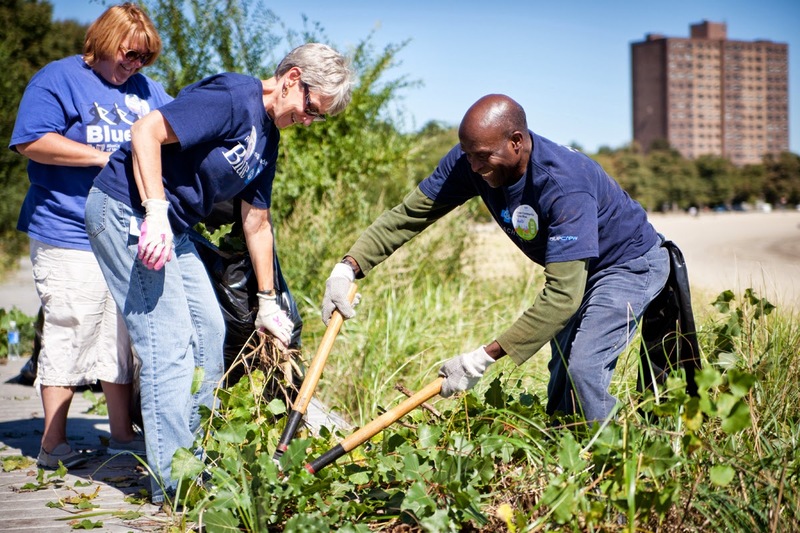 The 80 members of Blue Cross Blue Shield’s “Blue Crew” were part of the company’s 3rd annual company-wide service day, which included 3,000 employees and 16,000 service hours across the entire state. 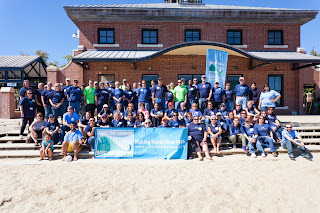 The “Blue Crew” partnered with Save the Harbor/Save the Bay and spent a full day removing trash, trimming bushes and overgrown brush, and weeding pathways and sidewalks that line the beach and adjacent parks and ball fields. In total, the “Blue Crew” beautified 12+ acres of public parks, including 2 miles of sandy swimming beaches and 3 miles of urban parkways and removed more than 7 tons of trash and landscape debris. 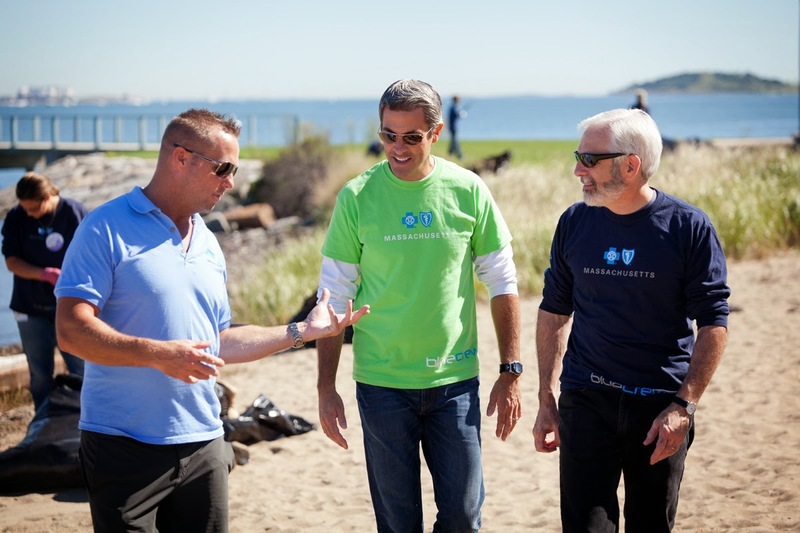 Andrew Dreyfus, President & CEO Blue Cross Blue Shield of Massachusetts and Jeff Bellows, VP of of Corportate Citizenship were on hand – and hands on - at the event. “We appreciate the opportunity to partner with Save the Harbor/Save the Bay to protect the public’s $4.5 billion investment in the Boston Harbor Cleanup. 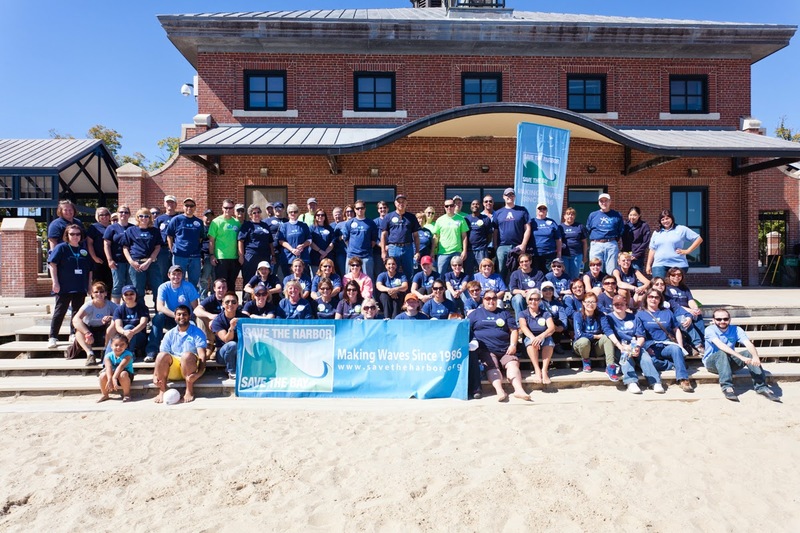 Our employees share the mission to restore our public beaches and our harbor”, said Dreyfus. 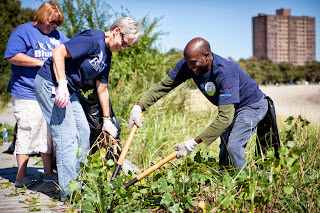 "Inspired by the vision and goals of our community partners, Service Day gives our associates the opportunity to strengthen cities, towns, and neighborhoods across Massachusetts and continues our more than 75 year legacy of community commitment - which has been a hallmark of Blue Cross since our founding." Thanks to everyone who took part in this great event. 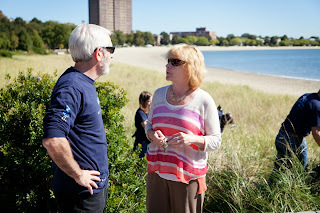 All of us at Save the Harbor really appreciate your hard work and commitment to our mission and our community. Christine Kelly Found Her Marble. Now Its Your Turn! 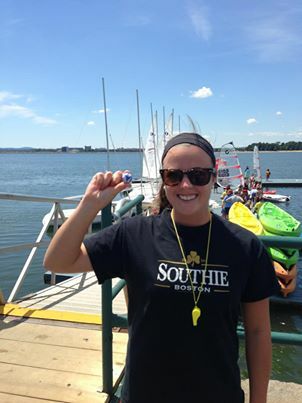 Congratulations to Southie resident Christine Kelly, who won a roundtrip ticket from JetBlue Airways to any domestic destination they serve from Boston’s Logan Airport in Save the Harbor/Save the Bay and JetBlue Airways’ 2nd annual “Simply Marble-ous” Treasure Hunt. to any domestic destination served by JetBlue Airways. Find a marble and you could be the next winner! Kelly was the first winner in this year’s treasure hunt, but there are still more than 200 marbles on Boston area beaches from Nahant to Nantasket, and two more winners to be chosen this fall. The next winner will be chosen on Columbus Day, and the contest ends on Halloween. 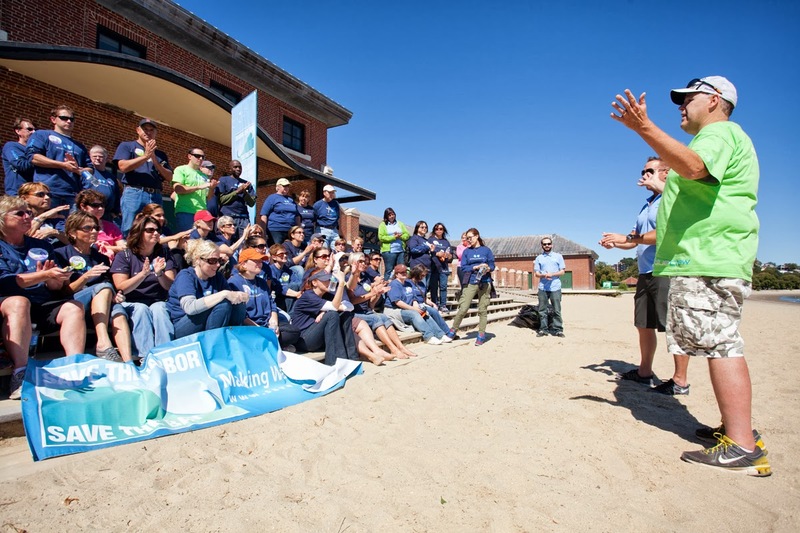 This is the second year that Save the Harbor and JetBlue Airways partnered for the contest that celebrates Boston Harbor and the region’s great public beaches. More than 250 marbles are still waiting for you to find on Boston area beaches in Lynn, Nahant, Revere, Winthrop, East Boston, South Boston, Dorchester, Quincy and Hull, so keep hunting! It is free and easy to enter the Simply Marble-ous Treasure Hunt. When you find a marble, just post a picture of yourself with the marble on Save the Harbor’s Facebook page at www.facebook.com/savetheharbor or email your photo and contact information to info@savetheharbor.org. Anyone who finds a marble between July 4 and October 31 will remain in the contest until the final drawing. Even if you don’t find a marble, you still have an opportunity to be entered into the contest. Make an online contribution at http://savetheharbor.org/contribution.html of any amount to Save the Harbor/Save the Bay between July 4 and October 31. Save the Harbor will announce the winners on their Facebook page at www.facebook.com/savetheharbor so stay tuned! It’s hard to believe that summer is already over! It seems like just yesterday I was cluelessly wandering the Boston Fish Pier trying to find the elusive Save the Harbor office and telling myself that I would eventually get used to the intense fish smell (not quite so). But alas, time flies when you’re having fun, right? Over the course of these short weeks I have had the opportunity to explore unique parts of the Boston Harbor, work with some of the best and most dedicated coworkers, catch more crabs than I had previously thought humanly possible and meet some of the most curious and inspiring kids from the different Boston communities. I came to Save the Harbor with the hope of sharing my enthusiasm for the environment and I can confidently say that I achieved that goal. Seeing all our Harbor Explorers show up early every single day (even on those gray and rainy ones) ready to get their hands dirty was incredibly rewarding and inspires hope for future generations of environmental conservationists. A special shout out to my JPAs - Jazeel, Monique, Nhu, and Vinh. The summer would not have been the same without you guys. Thanks for showing up every morning with smiles on your faces. The East Boston and Southie kids (and me!) will never forget their summer with you.